A roof has a number of components and they work together to ensure the structure is secure and resilient. 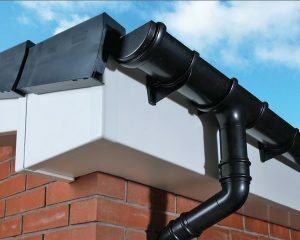 The gutters, fascias, and soffits are essential parts of the system and they’re also the most visible. Problems with these aspects of the rood can compromise its integrity and beauty. We at AC Joinery can repair or replace the UPVC gutters, fascias, and soffits; so if they’re damaged, just give us a call. We can repair all of these problems and replace the entire gutter system if needed. Our experts will deal with these problems quickly and make sure your gutters work well. We can also replace the older gutters with good-quality UPVC ones that would last for several years to come. The fascia is the vertical band that’s wrapped around the edges of the roof. It protects the roof system from moisture and adds a finished look to the surface. UPVC boards are very durable and can easily withstand the weather conditions. We can replace your old or decaying fascia boards with resilient UPVC ones. This would improve the overall look of your roof and protect the interiors from damage. The soffit covers and protects the visible underside of the roof. It extends from the wall to the fascia so any damage to it is immediately noticeable. We can replace your existing soffits with high-quality UPVC ones that are more resistant to weather and wear. They’re also quite affordable in comparison to other soffit materials. If you have any problems with these elements of the roof or want us to install UPVC gutters, fascias, and soffits, you can rely on our services. If you want to know more about UPVC gutters, fascias, and soffits, don’t hesitate to get in touch with here at AC Joinery, us. You can call us at 0161 980 7992 or contact us through our web form today.